The Sacred Valley was the seat of the Inca empire. 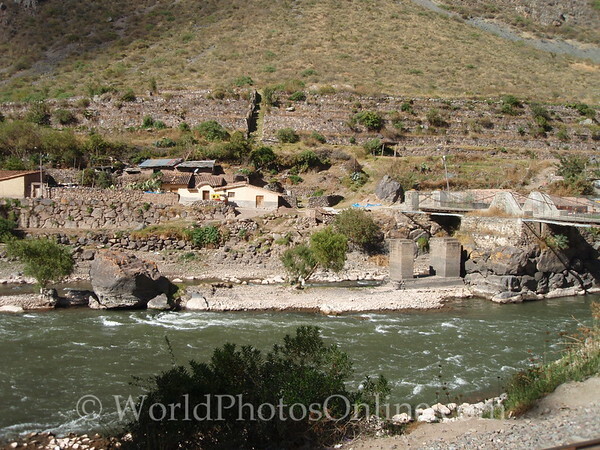 It is located in the Urubamba Valley in the Andes of Peru. It contains a wealth of Inca temples, cities, terraces, and artifacts as well as the descendents of the Inca people. The Inca capital is now known as Cusco. During our tour we drove around the valley and saw Inca ruins, as well as native people practicing many of the same crafts and traditions they did during the time of the Incas. At one point as we drove into the hill country surrounding Cusco we passed 12,590 feet of altitude. We drove to the town of Chincheros for a weaving demonstration. The weavers families have been weaving since Inca times and the demonstration included washing the wool using native roots, the native plants they used to dye the wool and not just one color but a rainbow of colors. Then they dyed some spun wool two colors and showed how lime juice could change purple dye to orange dye. They showed us the traditional spinning of yard and the traditional weaving process. It was one of the most detailed description I have seen and a really excellent demonstration. In Ollantaytambo we visited a traditional Peruvian hous. It was one room with a wood stove at one side and a bed at the other. The traditional Inca alcoves in the walls were used as shelves to store items and for shrines (both Inca and catholic style). There were guinea pigs on the floor which they fed when we arrived, so the animals were quite excided. This living arrangement dates back to the Inca times and before. Even the king lived in a similar room, although it was slightly larger, in Machu Picchu. The house is primarily used for sleeping and cooking, the majority other activities are usually done outside. During our drive we stopped at a small bar and the woman showed us how to make Chicha, a fermented corn beer. They take corn kernels and dry them in the sun, the get them moist and let them sprout. Once sprouted they soak them in water to extract the sugars and boil the resulting wort, then ferment in large pots for several days. The alcohol content is 0.5%, so it is not high. The men generally drink it right from the vat, but the woman pour it over crush strawberries, which changes the color from straw to pink and give it a light strawberry taste. Along our tour we had a photo stop over the town of Pisac and the Picac archeology site to look at some Inca terraces and hillside ruins. After over 500 years some of the terraces are still used for farming and have survived undamaged by the time or earthquakes.